Huffington Post: Shilling for the Israeli Occupation: The ADL's New Mission Statement? The Anti-Defamation League (ADL), fresh off of several PR gaffes, recently managed to pull off another head-scratching moment by compiling and releasing a list of the "top ten most influential anti-Israel groups in America." In other words, an organization that describes itself as "the nation's premier civil rights/human relations agency that fights anti-Semitism and all forms of bigotry, defends democratic ideals and protects civil rights for all" is spending its resources decrying American organizations that are not blindly supportive of a foreign government it likes to align itself with. If that's not fishy enough, what the ADL's list really showcases are the top ten most influential groups that have taken a principled anti-occupation and anti-displacement position and who call for a just peace. Why does that bother the ADL? The ADL is slowly but surely shifting its focus from fighting real bigotry to doing public relations work for the government of Israel, including shilling for its illegal occupation of Palestinian territories. The list includes many Jews including some who self-identify as friends of Israel, and yet the report still manages to accuse them of being anti-Israel and even anti-Semitic. This is because the ADL hopes it can convince you that anti-occupation is synonymous with anti-Israel and anti-Israel is synonymous with anti-Semitism. This latest stunt by the ADL comes on the heels of several other bizarre decisions, including the ADL's decision to side with far right-wing anti-religious freedom groups like the notorious SIOA (Stop the Islamization of America) against the proposed Islamic center near Ground Zero. So much for "fighting all forms of bigotry and defending democratic ideals and protecting civil rights for all." The ADL is now trying to backtrack from its position on this issue after a public backlash that seemed to take it by surprise. Since this list mostly targets organizations that have not been afraid to take a bold moral stance against the illegal Israeli occupation and other inhumane policies carried by the government of Israel against the occupied Palestinians, J Street ought to take a long hard look at itself and ask itself why it failed to make the list. Jewish Voice for Peace which proudly made the list wrote an excellent five point response to the ADL. If you were to contrast the morally expedient language of the ADL's report with the clarion values in the JVP's response, it is evident who represents the voice of extremism and who represents the voice of reason. Other "disturbingly" named organizations that accompany Jewish Voice for Peace include: Act Now to Stop War and End Racism, If Americans Knew, Students for Justice in Palestine, and US Campaign to End the Israeli Occupation. Peace? No War? No Racism? Knowledge? Justice? No Occupation? Horrifying stuff. The list also includes mainstream U.S. Muslim organizations like CAIR. CAIR, like the other organizations on the list, is pro-peace and anti-injustice. CAIR's work centers on defending civil rights and dispelling misinformation and stereotypes about Muslims - doing for America's Muslims what the ADL used to do (and should be doing) for America's Jews. It does not concern itself with the political aspect of the conflict but with the legal, civil and human rights aspects that have repercussions on local constituents here and that are often supported by our tax dollars. CAIR's position has been one of opposition to the occupation and disenfranchisement of Palestinians.The ADL cannot point to one release from CAIR that can be described as bigoted against Israelis as a people, let alone against Jews. CAIR's releases and rallies have only addressed the occupation and the questionable actions of the government of Israel. But as I mentioned the ADL tries to equate opposition to the occupation and the illegal practices of the Likud government to bigotry and anti-Semitism in order to create a chilling effect. The ADL's report is announced on the front page of the ADL's website, right above its decision to honor Rupert Murdoch for his "stalwart support of Israel" (yet another mind-boggling moment from the ADL). 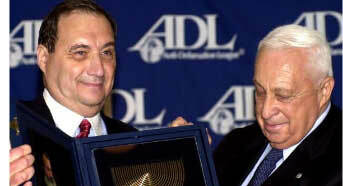 Why would the ADL who claims to "fight all forms of bigotry, defend democratic ideal and protects civil rights for all" turn around and award the man behind FOX News, a network that is notorious for spewing bigoted material and making a daily mockery of the news industry?Does the ADL really believe that FOX News "fights bigotry and promotes democratic ideals and equal civil rights for all"? Has Abe Foxman watched FOX News coverage of Muslims, Latinos, or immigrants lately? Why would the ADL offer Murdoch its "International leadership" award? Because the ADL's awardee selection committee is more concerned with where a candidate stands on Israel, even at the expense of where he stands on bigotry, democratic ideals, and equal civil rights - once again bringing to light the disturbing shift in the ADL's mission and raison d'etre. In response to the Israeli Navy's raid of a flotilla of ships heading to Gaza in May 2010, the executive director of CAIR-Chicago accused Israel of a "failure to apply Jewish values"
I am not sure what Abe Foxman's problem is with that? The Chicago Tribune piece that he is referring to was decidedly pro-Judaism. I received many thank you notes from Jewish friends and strangers including Rabbis. Given the gravity of the Israel violations at the time, many emailed to say that I was gracious and restrained. So why did Foxman take issue with this piece, you may ask? Well, because the piece was decidedly anti-occupation. Another exhibit for the ADL's changing priorities. I am not the only one calling out the ADL on its disgraceful switch in mission. Salon.com has some good coverage: Anti-Defamation League beclowns itself, again. As does the Daily Beast: The Anti-Defamation League has a new list out tarring human-rights activists in the name of protecting Israel. Michelle Goldberg on how the group is only disgracing itself.